Are You Aware of the Taxation Rule for NRIs? Gauging and planning funds in one country is a trouble; having to do in two different nations can be flummoxing. This happens with NRIs! When it comes to registering taxes, NRIs find themselves incapacitated as the Income Tax (IT) rules are different for different countries; one that is valid in India is invalid in other countries. The Income Tax Act, 1961 demarks a Non-Resident Indian (NRI) as an individual, who being a citizen of India by birth or a person of Indian origin, who isn’t a permanent resident of India. Over the years a number of Indians have moved and settled abroad for better employment opportunities. The number of Indians living abroad for business or permanent settlement is rising at a greater pace. People leave their home country for work, business, medical emergencies or a holiday. Does an NRI need to pay tax in India? Despite being a green card holder, many NRIs hold valid bank accounts in India where they invest and save money . If you are one among those having bank accounts in India, knowing the NRI taxation rules is crucial. Many NRIs opine they aren’t liable to pay any tax to the Government of India for the funds earned and banked here. Even if you are an NRI, you are apt to pay tax for the income earned or fixed in India. from business transactions and also the income generated from the investments or property in India. The primary and most important difference is an NRI resident has to pay tax only for the income earned in India. The income earned from foreign dealings (outside India) or investments (earned and received outside India) are exempted from tax. NRI income earned or received out of India will not be taxed by the Government of India. However, an Indian income earned and received in India is taxed as per the rules. There is no need for an NRI to file IT return if he/she doesn’t have any income in India. However, if you are benefiting from dividends, interests or property investments, whose amount is beyond the taxable limit, filing returns for you is compulsory. An NRI is entitled to claim refunds if his tax deducted at source is more than his actual tax liability. 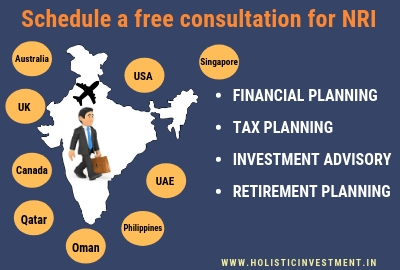 NRIs can save their income from taxation by investing in mediclaims, life insurance policies, tax saving mutual funds etc. NRI can also save up to 1 lakh on the repayment of the principal home loan amount. NRI can claim deduction of Rs.15,000 for the annual premium of a health insurance policy / mediclaim purchased in India for his family and additional Rs.20,000 can be claimed if he had paid premium for the senior citizen parents. If you are repaying an educational loan, you can claim deduction for this as well. NRIs are also allowed deductions for certain specified donations etc. 1. NRIs are not allowed to open a PPF account. However, an existing PPF account can be continued till maturity. 2. Deduction for handicapped person or treatment of disabled patients doesn't account for NRIs. – Any existing investments (those that were done / purchased before becoming an NRI) can be continued till maturity. Know the rules and pay your tax on time as per the rules.